VALENTIN CHMERKOVSKIY, THE WORLD CHAMPIONSHIP-WINNING AND BELOVED DANCING WITH THE STARS BALLROOM DANCER INVITES FANS INTO HIS LIFE AS NEVER BEFORE, SHARING THE EXPERIENCES, INCLUDING THE FAILURES AND SUCCESSES, THAT HAVE SHAPED HIM, FROM HIS EARLY CHILDHOOD IN UKRAINE TO GROWING UP AS AN IMMIGRANT IN THE U.S. TO HIS RISE TO INTERNATIONAL FAME. Val has captivated viewers of Dancing with the Stars since his first performance in 2011. While DWTS demonstrates Val’s beautiful physicality, this moving memoir illuminates his soul, revealing a deep, thoughtful person who channels his emotions and socially conscious views through his art. The beloved dance champion and choreographer assesses his life and career so far—where he’s come from and where he hopes to go. 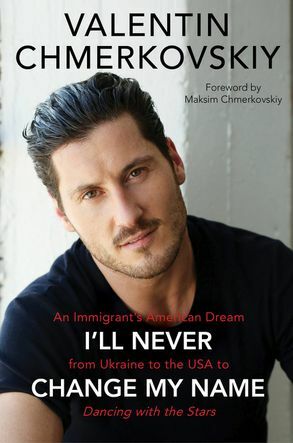 For the first time, Val looks back at his childhood in Odessa, Ukraine, and his Jewish family’s immigration to the United States—including what it was like to grow up as a stranger desperate to fit into a different culture, how he worked to become a premiere dancer, and, of course, the collaborations and competitions with his brother and fellow DWTS sensation, Maksim “Maks” Chmerkovskiy. Val Chmerkovskiy speaks warmly of his close-knit family and shares intimate and inspiring stories meant to offer hope and motivation not only to fans but to everyone with a dream. Enduring anti-Semitism in their native land, Val’s parents wanted a better life for their children—a desire that led them to leave everything they knew and start again thousands of miles away in a foreign country. It was a gamble that paid off—after years of practice and discipline, Val, along. $26.99 includes admission and (1) copy of I’ll Never Change My Name. If you’re unable to attend the event and would like a signed copy of I’ll Never Change My Name, please purchase the “Signed” version below.